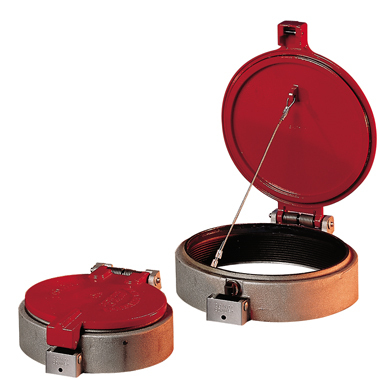 The OPW 202 Emergency Vent is designed to prevent an aboveground storage tank from becoming over-pressurized by providing full-bore, high-capacity venting in the event of a fire or blockage of the OPW 23, 113, 523V, or 623V. The 202 is a vapor-tight, spring-loaded emergency vent. When the AST builds pressure to 2.5 psi, the spring-loaded lid opens full-bore and discharges vapors upward to relieve the pressure. The lid remains open for inspection to indicate a problem with the normal tank venting, or if a fire has taken place, until manually reset. The appropriate 202 Series vent is determined by the emergency venting capacity requirements of the AST and the type of connection at the tank’s emergency vent opening. The OPW 202 Emergency Vent is available in 4″, 6″, and 8″ openings with female NPT connections. Lightweight Construction – Allows for safe, easy installation on large aboveground tanks. Spring-Loaded, O-ring Sealed Cover with Teflon®-Coated Seat – Ensures smooth, vapor-tight sealing surface and reliable service life. Full-Bore, High-Capacity Upward Venting – Enables smaller diameter vents, with higher venting capacity, to be used on ASTs when compared to weighted, mushroom-style vents. Aluminum Cover and Body with Stainless Steel Components – Corrosion-resistant construction to protect expensive finish or epoxy coatings on ASTs. Alerts Tank Operators of Possible Venting Problems – When the emergency vent is actuated, the lid remains open for inspection until manually reset. The actuation of the emergency vent indicates abnormal excessive pressure build-up in the tank due to either a blockage in the normal tank vent or in the event of a rapid expansion of vapors possibly from a fire. Easy Vent Reset – No extra parts required. Simply push the vent lid closed until an audible “click” is heard, indicating the vent is back in operation. UL Listed – To satisfy Third Party accreditation requirements of many jurisdictions.